Dean Harrison on his Silicone Engineering Racing Kawasaki. ''Picture: James Wright/DoubleRed. BRADFORD’S Dean Harrison will begin his dual bid for short-circuit and road-racing glory at Silverstone this weekend. The 30-year-old Isle of Man TT winner will be on the grid for the opening two rounds of the 2019 British Superbike Championship on Sunday looking to put his Silicone Engineering Racing Kawasaki right in the mix for points and top-10 finishes. While Harrison may not be in one of the top factory teams, he showed real promise in his debut season last year, picking up a couple of 12th-placed finishes while taking part in just four rounds. Twelve months on and the West Yorkshire rider will be competing in nine of the 12 rounds and, as a celebrated road-racer, he is determined to make his mark on the championship. Harrison is not under-estimating the difficulty of the task that awaits him. We want to get some points on the board but the plan is to get in the top 10. “The BSB is the toughest domestic championship in the world,” he added. “My bike’s a good bike and I’ve got a good team, but we are an independent team against the factory teams. 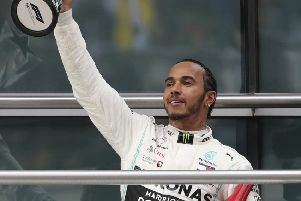 As well as Silverstone, Harrison will compete in the rounds at Oulton Park (twice), Knockhill, Snetterton, Cadwell Park, Assen, Donington Park and Brands Hatch. Unlike nearly all of his BSB contemporaries, Harrison will also be going all out for victories in all the blue riband road races of the year. He will compete at the North West 200 in Northern Ireland, the Isle of Man TT, the Southern 100, the Ulster Grand Prix, the Macau Grand Prix and will be at Oliver’s Mount when road-racing returns to Scarborough in July. “There’s a totally different aggression needed for short-circuit racing,” added Harrison, comparing the two forms of action. “You’ve just got to attack it and not care if you crash. You go into every corner just on the edge of sliding and losing grip. “At road-racing, you are carrying your corner speed more. You are flowing through the turns to carry the speed to get the average. At the TT, you set off in 10-second intervals, so it’s a time trial. “So it’s not like short-circuit racing when there’s 35 bikes on the grid and everyone’s breathing fire. It’s not as intense as that, you’ve got a bit of time to get your head into it. Harrison, sponsored by LSS Waste Management, will be joined on the grid on Sunday (1.30pm and 4.30pm) by fellow Yorkshire riders Dan Linfoot and Dean Hipwell. Qualifying will take place on Saturday.